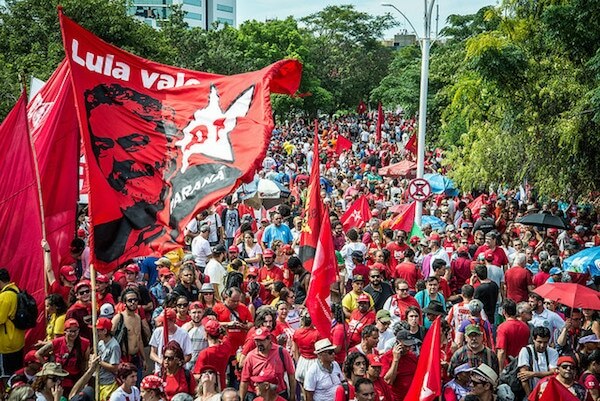 MR Online | A trial for Lula and Brazilian democracy: What’s next for Brazil? Several experts question the legality of the case. One of the most striking features of the entire process is the lack of evidence. After three years of a massive police operation—which has reportedly violated basic principles of due process, acted against the Brazilian Constitution, hindered the Defense, and deprived Lula of his basic human rights—the prosecutors were still not able to produce any concrete evidence to support their case. In the 218-page document presented by Moro, he failed to provide documentary proof that Lula was indeed the owner of the apartment. Furthermore, there were no elements that could assert that Lula was the author, co-author, or shareholder of the contracts deemed detrimental to Petrobras, or that any unlawful acts were carried out by OAS. Rather, Moro’s case is based on the testimony of José Adelmário Pinheiro Filho, also known as Léo Pinheiro, a former OAS executive who had his own sentence reduced by more than 80% after he changed his testimony to accuse Lula of illegal deeds. Pinheiro is not a witness, but rather, a co-defendant in this case, and as such he is under no legal obligation under Brazilian law to tell the truth or to present any proof for his testimony. The criminal case…resulted in a sentence that revealed a trial based on the willingness to convict of the judge to sustain the decision; that uses the criminal process of exception typical of authoritarian regimes. The judge allows for wide use of the Law in order to combat a ‘greater evil’, systemic corruption, and proceeds to disrespect the legal principle of [presumption of] innocence…. The swiftness of the appeals court to review Lula’s case is also suspicious. Other proceedings were postponed so that Lula’s trial could take place on January 24, the first available date after the summer recess. For Supreme Court Justice Luis Roberto Barroso, it was important, “in the name of judicial security and stability of the democratic game, …to define very soon what the rules will be, who can be a candidate”. If there was any doubt, the justice’s statement makes it even more evident that what is at stake is not the prosecution of a corruption case, but rather the upcoming presidential elections. Judicial violence against the constitutional principles of due process, even if examined only from the general point of view…, and even disregarding more visceral nullities that definitely invalidate the process, already configures sufficient material to determine the complete annulment of the criminal proceedings against Lula. The [Brazilian] contemporary criminal system begins to operate in tune with economic and political interests reinforced by the mass media, in the so-called phenomenon of criminal populism.… The state of exception formula applied to the punitive system eliminates normative control over repressive activity, allows for differentiated public policies for different social extracts…and is justified by the emotional approval of the population through the media, …instead of justifications of a legal, analytical and technical nature. In a coup d’état, one can know when it starts, but it is almost impossible to predict its end. The fear of those who promoted the coup [against Rousseff] to bear the political and legal costs of what they did…forces them to deepen the state of exception rather than soften it in the hope of promoting the ultimate destruction of their opponents. The only way out is to amplify the arbitrariness, to hunt down its enemies and to remain in power. As in 1968, the prospect of a free and truly democratic electoral process profoundly shocks the coup advocates…. After going to such lengths to regain power, it is clear that Brazil’s economic and political elites will not let go easily—no matter what it takes.